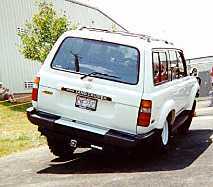 "A cheap option may be to replace the rear springs with those from an early DX. This will maintain your unladen ride height but are stiffer to reduce sag when loaded. It's not a huge difference, but a cheap one....This will also do little to reduce the dreaded "LandCruiser Lurch". chunks out of clouds. Don't know anyone running 861 and 862 combo. In fact, don't know if they hold them in stock. As far as shockers go, the firm valved N73 front and N74E rears will probably suite your style better than the lighter valved option (N70 & N71)." I fitted the heavier-duty springs and it made a *HUGE* difference. Do yourselves a favour and swap out the stock springs... my children just about suffered brain damage from all the lurching of the old beast set-up. It corners better, rides higher and is far more predictable in its behaviour - on- and off- road. I've been running OME 850's front and OME 860's in the rear since the beginning of the year - installed on our new 97tlc after a month or two. OME firm shocks all round as well. It was an upgrade well worth doing, made the tlc a more capable offroad machine and it rode much nicer to boot. Then a little bird whispered in my ear that he'd have a pair of 863's coming in and that I could take them if interested. So, a major life decision came along - tell the boss (the daily driver of the tlc) or 'sneak' them on. After consulting with my life insurance policy it was obvious that telling the boss (actually asking permission) was the sensible way to go. Fortunately the ok was given for a trial run. I put them on on Saturday afternoon - an easy job with jackstands and a highlift jack. 2) the ride quality is still excellent - I don't notice any -ve ride differences. The boss only notices that she has to pull herself up with the handgrips now (5' 4") and we have NO STINKING running boards! 3) the tlc handles corners VERY MUCH better. The tlc wallow is gone completely, I thought the 850/860 combo was a huge improvement over stock, but 863's are REAL NICE. Minor road imperfections (curbs etc) get swallowed up for breakfast. 4) the boss is quite happy, though any further increases in vehicle entrance height have now been tabled - I'll have to let some time go by before negotiating for 33" tyres... Maybe sidebars/steps would be in order next? Today I installed OME N71's shocks in the front and N71E's with the stock TLC Springs and bushings. 1. On road side small bumps, expansion joints and pot hole the ride has improved. 2. Body lean is reduced. 3. Front end seems a little softer with the rear slightly firmer. 4. OME shocks have a smoother action than stock units. 5. OME rebound quicker when compressed off the vehicle, possibly higher nitrogen charge? I'm of the belief that the firmer springs especially on the front are the best. 851 front and 860 rears are a bit too soft for me and many here in Aus (even on stock cruisers). The caster kit (see note) is nothing to be afraid of. They are now robust enough and are really only required if the vehicle directional stability is a bit nervous under brakes. James at Land Cruiser Connection has given me a lot of information and before I drop the bucks, I wanted to gather some more opinions just to get a warm fuzzy. He says the caster correction kit is required if you are not going to add the winch bar and winch right away. 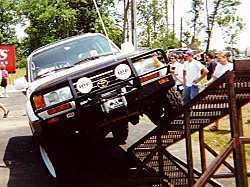 The weight of the winch bar and winch would push the front end down far enough that the caster correction kit is not needed. However if you add the OME suspension without the winch bar and winch, the angle of something will be changed enough to require the caster correction kit. This is a good combination if you're not carrying any serious weight. I would however consider the 850 front springs. The front end tends to be undersprung with 851's plus winch and bar. Oh, and maybe think about N74E's at the rear. They are stiffer and longer travel. It'll help control body lurching on the highway too. What springs and shocks do group members use? And what are your comments? 1. Handling small bumps like potholes on the road? The stock suspension rattles the entire truck on the smallest bumps. This will improve out of sight. Softly damped for the little stuff and really tightens up on the big bumps. 2. Turns on the road? The stock suspension seems firm and the body roll is negligible in my opinion. You'll end up with more body roll but you'll get used to it. It will handle better than stock. You may find it's more than 2" lift. For example, 863's will lift 4" and 864's will lift 5". The nominal 2" lift depends entirely on how much weight you carry. 4. Stability at highway speeds? Better highway stability with the firm shocks and caster kit. The caster kit helps make the car track straight (look ma, no hands). Not so much softer, but better controlled ride. Because you'll be sitting several inches higher, the suspension has that much more travel to dampen before bottoming. You'll be amazed at how well it will handle the rough stuff. 6. What's the deal with springs or shocks and articulation? Do softer springs give more articulation? or softer valves give more articulation? A softer spring will bottom easier, so you'll get full articulation before you do so with a heavy spring. Damping has little no effect on your articulation. A longer shock however will increase your wheel articulation, but you must be careful not to go too long and have a coil drop out. Any OME shock with an E after the number is an inch longer and quite safe to use. 7. Do you go really stiff springs to get weight carrying and lift, but compromise your articulation (ie one wheel will carry the entire weight of one end and not bottom out)? Or do you go for 851 and 860, get full articulation but bottom out often? It's all a compromise, but at least with OME, you'll get something that's designed for your 80. And let's face it, if you're not happy with something, it's only nickle-dime to get another set of springs or dampers. At one time or another, I've had every OME spring and damper (well, other than 851's) on my 80. As I change them, there's always someone there to buy them, or I just give them away if they've done any serious work. What does a caster kit do anyway? With the suspension lift you change the slope of the front axle. The caster kit simply brings your front axle back to the stock slope. The slope controls the caster angle which enables the truck to self center the steering (wind off it after a turn) If your truck looses this centering ability, it will start wandering all over the street and you will have very hard time steering straight. In more detail...the caster angle is the angle between the steering axis and the vertical axis. The caster correction kit that is offered by OME restores the caster angle to that of a stock vehicle. That said, on the 80-series, many users who install the OME kit find it's not necessary to install the caster correction bushings. This is because many of these users will also have a heavy ARB bull bar and winch combo up front that compresses the front end springs enough to not make the caster difference a problem. I have this very setup (HD OMEs in front) and my steering is just fine - return-to-center action is great. My suggestion is to install the kit first, then order the caster correction kit only if needed. Caster correction bush caution: Whilst the caster correction bushes are robust, they are stiffer than stock which results in increased stress on the leading arm brackets at the diff housing at full axle articulation. This leads to cracked brackets and eventually a cracked and leaking diff housing. There are a number of things one can do to aleviate the problem and one of the most novel (and eaiest) is described here. Should there be a savings in work billed if the caster modification is done while the truck is getting the new suspension? The two jobs have no overlap (well, other than getting it on the hoist), so there will be little if any cost benefit in having it done at once. Installing the caster bushes is a simple task but you need a press, so it's usually out of the realms of the home handyman. The job should take 1/2 hour, or if it's a first timer, maybe an hour. Over here, a fully installed caster kit costs $250 AUS, so they're charging like $100 AUS for labour. Drive the car for a few days without the caster kit. Don't go looking for differences because you'll be confused with the new ride of the suspension. Do however look for signs of the car wanting to dart left or right when braking around town, especially on a rough road. Is there any need to adjust the wheel alignment after new suspension is fitted? No need for a wheel alignment after the suspension. The only thing that can be adjusted is toe in and being a live front axle, the toe in isn't affected with the suspension lift. Camber and caster can't be adjusted (except accidentally... <crash>). My shocky bushes have had it... should I replace with poly bushes and a stronger washer? Are they as good/better than the standard black rubber bushes? I think the stock rubber bushes and washers are the best to use. Poly bushes are much harder and transmit more shock/vibration to the shock towers. That said, I'm currently running poly bushes but will go back to stock soon. As an aside, instead of running two nuts at the top of each shock, I've installed a single nylock nut. Makes it much easier to remove (with two nuts, you often have difficulty keeping the shock from turning when trying to loosen it. Have to end up using a rattle gun). No need to jack the car up, park on the flat, put it in gear and hand-brake on (for what it is worth). Two spanners/sockets - a 17mm and a 14mm I think (?) - undo both ends - and remove nuts and bolts and bushes (remember orientation - helps putting them back). Compress the shock by pushing upwards, then remove before it forces back - a deft hand is required. Tip: wear safety glasses or sun glasses, as bits of crap and muck comes raining down on you as you do the work. Then compress the new shock and slip it into the space briskly. Then replace bushes (put new bushes in and keep your old ones as spares) and the bolts and nuts and Bob's your proverbial Uncle!